Please note: Some of the boxes are in a tatty state but the product inside is unaffected. This has been reflected in the selling price. Finding safe, clean and easy passage in the garden is not always easy! With the Garden Track, it is possible to create an instant, robust and weatherproof walkway in seconds. The Garden Track consists of 24 panels, connected by sturdy link pins, to create a 3 metre long path. It allows for easy passage over muddy terrain or gravel, while the 'snaking action' adapts easily to uneven ground. The Garden Track is particularly useful at preventing lawn damage caused by regular and repeated foot traffic. 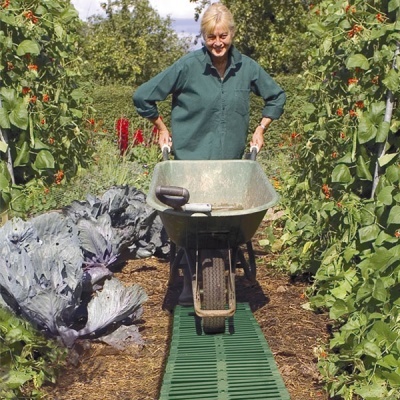 Examples can be found in routes to and from vegetable beds, compost bins and washing lines. The Garden Track will also be of real use to campers and caravanners, as well as offering a useful access solution to wheelchair users, when negotiating problem surfaces such as wet ground and gravel. One time, self assembly is required but this takes a matter of minutes and no tools are required. Once assembled, the unit packs flat for easy storage. Each Garden Track can be extended to provide a longer pathway using the additional link pins provided. 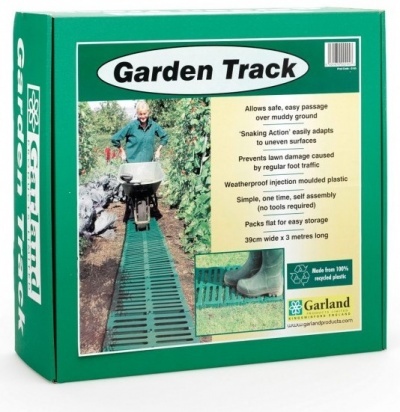 Each Garden Track panel is made from recycled polypropylene, while the link clips are in nylon.